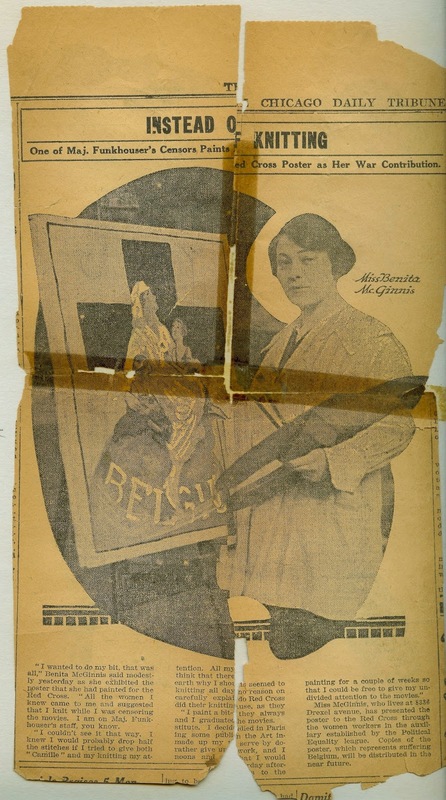 As the Great War (later to be called World War I) broke out in Europe in 1914, barely a year after arriving home from her trip there, my great-aunt Detty (Benita McGinnis McCormick), like most women of the era, threw herself into a flurry of patriotic activity. Her efforts took on renewed urgency after her youngest brother, John, an officer in the Army cavalry, returned with horrific stories from the front, having fought in the Battle of the Somme. Feeling a personal call to increase the public’s awareness of wartime suffering abroad, Benita turned to her artistic talents. One of her projects was to paint a poster for the Red Cross. The Chicago Tribune profiled her contribution in a feature story on November 10, 1917. Benita later pasted a copy of the article in a scrapbook she created of her life’s memories. on a page from Benita (McGinnis) McCormick’s scrapbook. One of Maj. Funkhouser’s Censors Paints Red Cross Poster as her War Contribution. “I wanted to do my bit, that was all,” Benita McGinnis said modestly yesterday as she exhibited the poster that she had painted for the Red Cross. “All the women I knew came to me and suggested that I knit while I was censoring the movies. I am on Maj. Funkhouser’s staff, you know. “I couldn’t see it that way. I knew I would probably drop half the stitches if I tried to give both “Camille” [a popular silent film] and my knitting my attention. All my friends seemed to think that there was no reason on earth why I shouldn’t do Red Cross knitting all day because, as they did their knitting, they always did it at the movies. Miss McGinnis, who lives at 8336 Drexel avenue (sic), has presented the poster to the Red Cross through the women workers in the auxiliary established by the Political Equality league. Copies of the poster, which represents suffering Belgium, will be distributed in the near future. If you caught the reference to Benita as “one of Maj. Funkhouser’s Censors,” you’ll want to come back tomorrow to learn more. She was full of surprises. Wow! This is interesting. Such a wonderful piece of history in addition to your own family's history. Fascinating story Linda. I can't wait to read about censoring! Smadar, many thanks – and welcome back from your "sabbatical"! I've tried to take up knitting, but I'm always dropping stitches or making some mistake. I fully understand her concern about knitting in the dark. 🙂 Besides, she had much to contribute with her other talents. That is very kind of you, Jana – thank you so much. Right – always best to follow your passion and not just do what everyone else is doing!